It’s “Fair Season” in Lancaster County, so I’m reminded that the BIG fair of the bunch, in Ephrata, is just around the corner. And my favorite thing about the Ephrata Fair is the Smithton Inn’s location! We’re close enough to walk to ALL the festivities, but we’re located OUTSIDE the road-closure zone. Let me assure you, this is a very good thing! 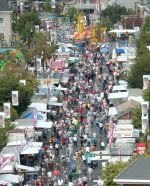 During the week of September 21 – 25, Pennsylvania’s largest Street Fair transforms the streets of downtown Ephrata from busy roads with cars and trucks to a week of enjoyment and entertainment. Both Main and State Streets (downtown) are closed to make room for rides and local food stands, offering fun, relaxation and a chance to mingle with friends. Also scattered throughout town are displays of food, vegetables, crafts and the Agriculture exhibit at the park. Community Tug-of-War: Thursday, September 23rd at 8:00 pm: 12 teams, maximum 10 members/2,000 lbs each, vying for local bragging rights… nuff said! So, if you’re looking for a family-fun, unique, festive way to spend your last week in September, look no further. Call right away to book your room at the Smithton Inn Bed and Breakfast, we’re likely to fill up quickly.